Welcome to Paint Jam 2017! 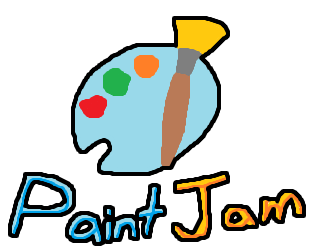 Paint Jam is a game jam based off the high tech, revolutionary, graphics editor that comes pre-installed on Windows whatever. This jam is for people who want an excuse to make a little game using only MS Paint as a graphics editing tool. Looking for Paint Jam 2018? You can use other art tools to create transparency. You can use source code and stuff you wrote before the jam, but don't use anything that would get you in legal trouble. Do not infringe copyright laws. Don't do something that will make me edit this rules section. These are little optional things you can do to make your life a living hell. Make all your sound effect by saying stuff into a mic. Onomatopoeia recommended. Only use the paint color palette. No choosing other colors. Make a 3D game only using flat images. No meshes except for like the world/levels. Use only comic sans for any in-game font. Draw your assets without a drawing tablet. All I have is swords and potions. Pobsy's ready for a fun day! Sentient bread runs around kitchen. Run, Jump And Don't Die! A easy tower defense game. Defend your candies as long as you can! Move your mouse to dodge asteroids. Easy to pick up, hard to master. Grow your chest to get cool rewards! How Long Can You Endure? Glitch Tracker, a FPAS made on Unity. This game was made for the Paint Jam.